Teacher Aadina Balti has tenure, but says it's no reason for her, or any other teacher, to stop innovating. 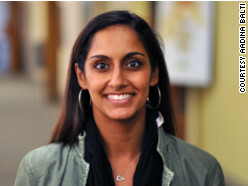 Editor's note: Aadina Balti is a veteran teacher and math coach in Boston's public school system. Balti is certified in moderate disabilities and elementary education. She is also a Teach Plus Teaching Policy Fellow. (CNN) - I've been in the classroom for 11 years - that makes me a minority in the teaching profession, as more than half of all teachers have taught for a decade or less. But I'm still striving to be a better teacher. A recent report from national nonprofit Teach Plus shows that veteran teachers like me tend to be less receptive to the growing emphasis on teacher performance than our less-experienced colleagues. The report, "Great Expectations: Teachers' Views on Elevating the Teaching Profession," highlights data from Teach Plus' recent national survey of teachers, showing that 42% of earlier-career teachers (called the "new majority" in the report) support more performance-based tenure and compensation systems, compared to just 15% of my fellow veterans. As a teacher who has just crossed the line from new majority to veteran status, I understand how experienced teachers feel about the protections afforded them by the tenure system. I understand because I’ve put in the time and effort necessary to establish myself in the school system. I understand because I, too, value my job security. Sometimes I even understand that it's easy to get comfortable and fall into doing the same old thing. But the current lack of accountability is bringing our profession down. While I value the tenure I've been granted, I would be willing to give up that protection to move our profession toward one that emphasizes performance. I got into this profession because I want to have a positive impact on society and because I feel confident that all children can learn. As an educator, it's my job to make that happen. I ask my students to push themselves for excellence every day. If I’m not pushing myself for excellence, too, then I’m not just failing myself, I’m failing my students. I've been at one school my whole career, and I've seen that, over time, many teachers tend to burn out or become resistant to change. There's good reason for this. Change is hard, and teachers are constantly subjected to new programs, policies and curricula and expected to implement them with limited support or preparation. But it's important that we remain willing to make changes so long as they benefit our students. As the math facilitator for my school, I worked with my administration to make a drastic change in our curriculum, away from what the rest of the district was using. Based on my experience with multiple math programs, I felt that this new curriculum was more comprehensive and better aligned with the Common Core Standards, so I decided, along with two colleagues, to pilot it in our classrooms. The results were astounding. Our students not only demonstrated proficiency, but they also outperformed other classes across the district. But when we moved to adopt this successful curriculum schoolwide, we met resistance from colleagues: they were comfortable with the curriculum we’d been using for years. It was frustrating to see that not all classrooms were implementing the curriculum fully - and not getting the best possible outcomes for students. Our state test results showed discrepancies across classrooms: We all used the same curriculum, received the same professional development and taught the same student population. The only difference was teacher implementation. Those of us willing to embrace the change got better results. Our job is too vital to allow ourselves to ever rest on our laurels. It is our responsibility to be innovative and relentless in our pursuit of excellence for the sake of our students, not just in our first year in the field, not just in our first few years, but always. If we want respect as highly skilled professionals, we need to be held - and hold ourselves - to the highest standards. Part of achieving this level of professionalism is building a tenure system that acknowledges performance. Rather than using only time in the classroom to earn tenure, I suggest a system that requires a minimum of three years of experience and proficient or exemplary performance ratings using a rigorous evaluation tool before tenure can be granted. Once we have established ourselves, it should be our responsibility and the responsibility of the school system to ensure that we maintain tenure through continued evaluation and professional development. Of course, I recognize that we need a fair and objective system that determines teachers’ effectiveness. It’s vital that we play close attention to how new evaluation systems are being rolled out: Evaluators need to be qualified and properly trained, and multiple measures need to be used to determine teacher effectiveness and student growth. When we prove ourselves proficient or exemplary, we should be rewarded accordingly. Teachers who fall short should have the opportunity to improve through a time-limited support plan. What good is a teacher who consistently receives poor ratings? And what good is a system that doesn’t help struggling teachers improve? Teaching isn’t an easy job, and - like people of all professions - we occasionally have bad days. But we deserve a system that motivates us to do our best. If our job security depends on our performance, then we need to prove that we have what it takes. Otherwise, we are failing our students and our schools - and our profession is failing us. Regardless of how many years I have under my belt, I will continue to feel this way. I will continue to want teaching to be respected as a profession of highly skilled individuals. High standards are the way to achieve this. If I stop aiming for excellence, if my students stop growing and achieving in my classroom, I’ll know my time as an educator is up. The opinions expressed in this commentary are solely those of Aadina Balti. Well if tenure were the disease that kills good teaching and better schools, why is it that the states that do the best are those that are unionized, such as Massachusetts? Where is Mississippi in comparison? Kudos to you for putting the needs of your students first! You are a model for all educators by taking personal ownership of the responsibilities of your profession. Ther is a large problem with this statment:"Our state test results showed discrepancies across classrooms: We all used the same curriculum, received the same professional development and taught the same student population. The only difference was teacher implementation. Those of us willing to embrace the change got better results." There was one HUGE variable: the students. Did each teacher have the exact same students who came with the exact same prior knowledge and life experiences? Any behavior problems? You are making sweeping statements about such a small informal sample. LArge scale studies have shown the enormous impact of students' prior knowledge, history,etc on their test scores. That is exactly why VAM models do not work. The problem with merit pay is that it costs money. In business, it's simple. "We made more money, so we must have done a good job, and we're going to spread the extra money among the people who helped earn it. The more they helped, the more we will reward them for doing a good job." But school districts do not earn more money for doing a better job. No school district will ever be going to the public and saying, "Look, all of our teachers did an exemplary job this year, so we need to raise taxes to give them the merit pay they deserve." School districts will have a set amount of money to split up for paying teachers. Teacher merit pay will be based on what the district has in the kitty. And since personnel costs are the largest chunk of most districts' budgets, that will be a place to cut in tough times. "Mrs. Smith, you did exemplary work this year, as did 45 of your colleagues, so your cut of the merit pay pie this year is $1.50." School districts need to recruit and retain the best. "Come work for us. Enjoy the prospect of a career that may be ended at any time for any reason, and we may never give you a raise ever" is not the sort of slogan that will draw the best people to the profession. "Of course, I recognize that we need a fair and objective system that determines teachers’ effectiveness. It’s vital that we play close attention to how new evaluation systems are being rolled out:"
And how will paying close attention help? If the evaluation system is unfair or improperly applied or unreasonable, what will you, as an untenured teacher, do? Will you speak up? And if you are ignored, will you keep speaking up, louder and louder, even though you may be fired for it? Exactly how much voice do you think you will have? And if the end of your eleventh year is a call to come meet with the administrator to be told that, despite your fine performance this year, there simply isn't any money to give you a performance based raise this year, so you'll need to just take a wage freeze this year. And next year. And for the decade after that. What will you, as an untenured teacher, do? "When we have proven ourselves exemplary–" at what, exactly. It sounds like you implemented an excellent test-prep program. As an 11-year veteran, do you think that a standardized test is the best measure of what you've done? Would you say that is also true for writing, art, music and other disciplines? And if your administration decides that it wants to use a test that in your professional judgment is flawed, what would you, as an untenured teacher, do? I've taught for over thirty years, getting better (or at least trying to) with every passing year. Nothing annoys me as much as teachers in my building who can't or won't do their job. I would applaud happily to see them gone or improved. But that could happen tomorrow, and we wouldn't have to change a single law to do it. All that would have to happen is that administrators would have to start doing THEIR jobs. And I can go ahead and say that without fear of reprisal, because I have tenure. Mainstream news organizations LOVE when teachers, & members of other unions, HUMBLE themselves & express any wish to decline the gains their forebears struck, shed tears & even bled for. "Performance"-based compensation for teachers is another of an endless series of "accountability" ideas that WILL NOT solve the problem of Johnny or June's failure to learn. Basing the compensation of teachers on the performance of students makes as much sense as basing the compensation of oncologists on the survival rates of their patients. At least the oncologist's patients want to live. Yes; not all students want to learn. Bill Maher grasped the conflict between parents & teachers this way: America's answer to the lack of student achievement? "Fire the [tenured] teachers!" Maher's answer, "Fire the parents." BTW, it wasn't a parent to led a CLASS of Newtown elementary school students to safety. Parents may have led their own children away. But a teacher led the CLASS. When was the last time your banker or lawyer or hedge fund manage did anything similar? Where's the outcry for evaluation of any of them based on the "performance" of their customers or clients? I'LL THINK OF RENOUNCING TENURE WHEN WALL STREET BANKERS RENOUNCE THEIR BONUSES. As a teacher with 28 years of dedicated ( if I may say so ) service, I'd like to point out that it is these tenured teachers that are the driving force behind efforts to improve education. Sure, I've seen bad examples, but I've also seen dedicated teachers who, without tenure, would not have been able to stand and fight for beneficial programs, quality curriculum, and cutting edge staff development. Tenure is due process, true. It protects us against being victimized by kooky parents, board members, and administrators. In so doing it gives us traction in the struggle for educational improvement. Exactly. How many teachers would be taking the lead in trying to implement new programs if they knew it could cost them their job? There is a former teacher out in Ca. that was teaching for nearly 25 years. It was discovered that he was abusing his students. So, when he was charged, he pulled his papers and retired with full retirement benefits. He is in jail awaiting trial and will collect full benefits until he dies. How can the teachers union, administrators, managers and anyone else involved in this explain this? Personally, it was this situation that put me over the edge. I will not vote for any money going to schools until this addressed. That situation is indeed horrific, and should absolutely not be happening, assuming the teacher is indeed guilty (I'm not familiar with the case myself so I can't really comment on it). But please don't go thinking that all teachers, or unions, or school districts, or even all definitions of "tenure," are equal. There a difference between having access to due process and abusing a system. Way to go, withhold your "charity money" because some jerk broke the law...that'll show 'em...you are part of the problem. If tenure goes away, then what happens is that the school will fire teachers just before they become eligible for retirement benefits. If tenure goes away, then all of the teacher's salaries should be raised significantly, because they can no longer count on retirement benefits. Unfortunately, employers are no longer faithful these days - employees are just cogs from which they can squeeze productivity. Rather than getting rid of tenure, have higher standards for tenure. Maybe even have a promotion structure after tenure in order to continue the incentive to improve. But don't get rid of tenure unless you double the teachers salaries. Otherwise, I guarantee nobody will want to be teacher. Tenure is there to protect a teacher from getting fired for bogus reasons like not passing the school board members kid or the star basketball player. Tenure helps those good teachers that try to teach and hold their students to high standards and those kids do not apply themselves. So this article is totally off in regards to what tenure is supposed to do. If the principals and administrators would actually supervise and do appraisals of teachers then those "bad" teachers would be found. Just saying. This is a terrible article... Disingenuous at best. Blatant falsehood more likely. The basis for performance evaluation is a flawed premise at it's core. The author glosses over a very important bit: who does the evaluations? "I recognize that we need a fair and objective system that determines teachers’ effectiveness." No kidding? And who would you nominate? I am more interested in effective teaching: not some BS standard, not replacing teachers every year with one's with no experience. Why is it that over half of the teachers in America have less than 10 years experience? The experienced one's quit. That is why. Pay the teachers more, fund the schools, stop the red tape and bureaucratic sprawl, and teach. Easy enough, right? Three years is not long enough to obtain any type of tenure. See, what most people neglect is that schools have very, very intense political battles waging within them constantly. One power-obsessed administrator could demolish careers simply because they want to "stack the courts" with their own choice of teachers. 3 years might not be long enough to establish tenure, but it's also not long enough to establish whether or not someone will be a good teacher. It's said that it takes 10,000 hours to be good at what you do. That gives you 5 years of practice before you can really be a good teacher. In my brief time, I've already had to battle against a power-hungry administrator who was famous for firing off classified staff like they they were serfs in his fiefdom. The only thing that saved me was that my department heads championed my cause and we were able to oppose him over his head. One thing that needs to occur, is holding back kids that make poor grades from not trying… Kids are being “pushed forward” while still failing at what they are leaving behind… This is a part of our education “system” that is failing both teachers and students… I have been a Math teacher... I have had Pre-calculus students who couldn't do Algebra I... I wondered how they got to Pre-Calc??? That may well have been because an administrator changed the grade(s) of some students or over-rode a teacher's grades or recommendations to make his/her look good. It's common practice in many districts to move students up to the next grade regardless of their existing grades. This results in many students who get to high school, where grades suddenly matter, deciding that working their butts off for good grades doesn't lead to anything, and students who still think they can sit on their laurels and make it to graduation. As a 9th grade teacher, that was a very, very rough reality to break them into. Tenures are outdated. Time does not deserve rewards. Results do! "Results" as defined by whom? Yes, results deserve reward, and one of those results should be tenure. That's how it works at the university level. Tenure is very far from automatic there. Very well said. I wish more teachers would see it this way. Miss Balti, rather than be the turd in the punch bowl, offering up tenures that are not yours to give away and writing to represent teachers whom you in no way represent – I would ask you to personally renounce your tenure. Give yours up, teach for a few more years, and ask yourself if you are a better teacher for not having your tenure. You see, Miss Balti isn't concerned about tenure, becuase she feels that her position at Teach Plus and years of teaching insulates her against being fired. She is right. No administor is going to fire a teach with a national pulpit to speak from. No administor is likely to trade in a ten year teacher for a first year question mark. She isn't offering up her tenure – she is offering up the tenure of teachers that she sees as being inferior to herself. Every falculty has those teachers. Some are suckups, some are workaholics, some simply have no other life or interest outside of the classroom, but all are marked by a driving ambition. Teachers who are content to simply teach as a profession and have full lives outside of the classroom, rather than martyring themselves for the "calling" of education seem lazy or defective to these devotees. I'm not saying there are not bad teacher – we all had them growing up. Think through the teachers you had growing up – the good, the bad, the forgettable. Was it always the case that the teachers who had nothing else going on in their lives were the best? I'm glad that I had teachers who had interest outside of school. The ones who went hunting and fishing made education much more real to me (who would have rather been doing those things). The ones who were my boyscout leaders, deacons at my church, or spent their summers doing missions in China reached me much more than the little old ladies or the women teaching inbetween children. Again, Miss Barti, give up YOUR tenure and see if it makes you a better teacher. Then ask if taking away the tenure of teachers who don't want to give it up would even be half as helpful. Then come clean and admit that you are really just saying that you wish that you could fire teachers who don't measure up to your standards and that you "giving up" tenure is really you wishing that you had more power over your collegues who are living more ballanced lives outside of the classroom. I *should* have been able to expect tenure AND administrative support. I *should* have been able to feel safe in my classroom, I *should* have felt that if administrators had a problem with something I was doing, then my subject matter supervisor could be called in or I might have been assigned a mentor rather than be subjected to administrative bullying and harassment. Absent that situation, at least tenure gave me the option to find a better position and to defend myself against evaluations that were done with minimal observation and by two principals, one of whom had an agenda and the other who was in her first (and only) year as a principal and was frankly the most inept administrator I ever worked under (and there have been many). In schools where administrators did their jobs, where they supported all their teachers – and suggested mentoring or other support when appropriate – a lot more progress was made all around. We didn't have to cling to tenure as a backup if things went horribly wrong, because those principals made sure we had the tools we needed to do our best job – but we DID have tenure as a backup for when those principals moved on or retired and new ones made for new dynamics. Having been through what I have, there is no way I would trade out tenure. I'm in favor of bad teachers being removed from classrooms, but I'm also painfully aware that it only takes one bad/inept/vengeful administrator to *call* a teacher a "bad teacher," and that takes a long time to recover from. I'm grateful that I was able to prove myself in a better setting; without tenure, without the ability to take a stand and insist on due process, I shudder to think what might have happened to my career. It would have been much too easy to sweep me under the rug, and for my students to have lost access to an entire music program under the guise of "under-enrollment." The problem is with performance based tenure (or merit pay) is that it's very difficult to determine if a teacher is doing well or not. You'd think it would be easy, but it's not. Every class a teacher gets from year to year is different with different challenges. A teacher may have a class full of motivated and extremely bright students one year and then get a class of unmotivated students that struggle academically the next year. The first year their test score numbers will look phenomenal, then the next year not so much. Then you have to factor in teachers that teach special needs children, children that are not going to score at grade level or get great scores when compared to their non-special needs peers. The tests don't measure how much growth a student has achieved under a teacher, only whether they are performing at grade level or not. For example, if a student comes into a 7th grade classroom reading at a 2nd grade level and by the end of the year is reading at a 5th grade level, that's tremendous growth and a great accomplishment for both the student and teacher, but the test will just say that the student is performing poorly below grade level. We're dealing with PEOPLE here, not cogs in a machine. I will also say that I would be happy to have the rules of tenure changed to include performance IF parents and students were being held accountable as well. They are not. Until that happens, it would be a mistake to change the tenure rules. As for teachers being reluctant to change, I understand what this author is saying, and people are generally resistant to change, but teachers have been overburdened and burned for years by each new fad that comes along that they have to be trained to teach and learn the curriculum only for it to be deemed a failure and chucked out when the next "new best thing" comes along. We need to find what REALLY works as far as teaching methods and curriculum goes instead of school districts hopping on the newest bandwagon every 3-5 years because some slick salesman from some for profit educational group or text book company convinced admin that it's "the answer" and then laughs all the way to the bank. Studies show that the most effective element in a classroom is the teacher's own enthusiasm. Stand with your teachers, make them feel appreciated, and most of them will perform. Continue to wage war on them and treat them like bank robbers and you can't expect them to behave accordingly. Exactly. At my last teaching job, I had a principal that for whatever reason (and I wasn't just having persecution delusions, other teachers noticed it too and I wasn't the only one that she treated poorly) made it her mission to make my life miserable. She would try to write me up for stupid things like a kid left their locker open a crack...I'm not exaggerating. I was always in the union rep's room over stupid stuff like that and he'd go talk to her and come back to me saying "It's taken care of. Don't worry about it." She'd stop me in the hallway as I was bringing my class back from art or music or whatever and berate me right there in front of them in the hallway over something completely stupid thus undermining my authority with my students. Evaluations were nothing but an opportunity for her to heap criticism after criticism on me and basically tell me I was a horrible teacher. At all my previous teaching positions I had gotten glowing reviews. I figured out very fast why that school had such a high teacher turnover rate. Of the eight teachers that had started new along with me the year I was hired, I was the only one still there after two years. One of them quit the profession and went back to school to become an optometrist. By my third year though I'd been dragged through the mud so badly that I had little enthusiasm or motivation for my work. I was on the verge of a nervous breakdown and I felt like a soldier getting ready to go into battle every morning as I went to work. I knew it was time to leave. The few teachers that had tenure she left alone. The ones that didn't were the ones that she victimized. As a National Board Certified veteran teacher of 13 years, I have to agree with Roman. We are always blamed when many of the problems begin at home. I can not tell you the number of times I have had parents accuse me of lying about their child's behavior or reply that their child wouldn't lie! Most parents are at least trying to do the right thing but a significant minority (and they are not all minorities-this group is as diverse as the student population) have no control of their children or are so whacked out on drugs, that their only reason for talking to teachers is to pay back the slights they felt they suffered when they were in school. What Aadina doesn't address is that every educational reform will show results IF the teachers buy in. She does mention how many waves of reform we are innundated by and the lack of support and training we get to implement these "fads". To elaborate on the fads I've seen, I've been teaching for a mere three years. In that time, I have sat through administrative lectures that amount to this: "Look, I know we said this last year, but this year we want you to read and implement this book because it's really super-effective." While I am not averse to free books from the district, I sit here with my Kagan strategies, AVID Path training book, Teach Like a Champion, my CHAMPS/ACHIEVE propaganda pamphlet, my "The First Days of School" book, and while I know they have all been very useful, I also cannot help but notice that they all pretty much say the same things. And let's not forget the nightmares of programs like NCLB. That one's good fun. I second Kathy's comments. While I agree with many of the points Balti makes in her piece, tenure (which for teachers is actually just due process) and better teaching are not mutually exclusive. We can and should have both. But doesn't this ignore basic economics? Reducing job security, in any job, makes that job less desirable. When you make a job less desirable, you attract lower-quality applicants. If we're going to make teaching a less desirable job by *significantly* reducing job security, then that move absolutely has to be coupled with something on the other side (higher pay, better working conditions, etc.). Otherwise won't we just be putting worse teachers in with our children? We need to be making teaching a more attractive profession to our star college graduates who have many other options. This proposal makes it less attractive. Yikes! Your reply makes nonsense at all. I am a mother of 4 school-aged children. The expectation in this county is that the parents/caregivers are the very first "teachers" in a child's life. If a child is receiving no home-training in the areas of respect, values, self-worth, etc. then a school teacher has to try to teach those basics along with academics which cuts down on academic learning time. True enough a teacher is supposed to be able to handle a room full of students, but let's be honest here: a room full of students w basic home-training is different then a room full of students where a quarter of them aren't being parented properly. We can not expect out teachers to raise our children. We as parents should be sending them to school with a sense of self-respect, if nothing else. At the same time, I've known teachers who have given up control of the classroom to the students at the first sign of adversity...that shouldn't happen. I am a first-year high school teacher. I entered the profession at 41 years old. I have taught college while abroad in Peru and tutored for my university here. All I want, as do so many other teachers, is for parents to prepare their students to enter the school "wanting to learn." The public thinks teachers are failing because apparently they are not "good at teaching their subject". That is false. What the public doesn't know is most of a teacher's time is wasted these days, trying to just get students to want to learn. They want to talk, argue, text, complain, sleep – everything but pay attention. A great college teacher is someone who is an expert in the field and can pass that knowledge on. A great secondary teacher is someone who may or may not be an expert in the field, but someone who can get a kid to want to learn. Teachers do not like this. Teachers want to TEACH, not be the parent, coach, motivator, inspiration – but that is what Hollywood has portrayed. Example: A math teacher loves math. He/She wants to spend the teaching hour talking about all things math. They want to show all the wonderful things math can do. In today's classroom they get about 10 minutes of math in and 40 minutes of be quiet, stop talking, stop eating, stop texting, stop talking back, wake up. The most common response, "i don't care. I don't want to be here. My parents say an auto mechanic does not need algebra, so fail me." You know that being a teacher is a job that does require you to be able to control a room full of kids along with being able to impart knowledge to them right? Your only job isn't to teach your class, you have to learn how to get their attention. You are no teacher if you can't, you are just an lady in a classroom with a bunch of kids who are not listening. Parents can't make you be good at it, and neither can anyone else except you. Take responsibility for your failings and stop blaming parents for the bad behavior you are allowing in your classroom. I taught middle school for a year. At least half the kids did not ever do their homework. That's what parents need to make sure happens. My kids did well WHILE THEY WERE IN CLASS. When they're out of class, though, I'm not going to take the time to call every last one of them to make sure they do their homework and bring it to class. Sorry you don't seem to understand this. Yikes! Your reply makes no sense at all. I am a mother of 4 school-aged children. The expectation in this county is that the parents/caregivers are the very first "teachers" in a child's life. If a child is receiving no home-training in the areas of respect, values, self-worth, etc. then a school teacher has to try to teach those basics along with academics which cuts down on academic learning time. True enough a teacher is supposed to be able to handle a room full of students, but let's be honest here: a room full of students w basic home-training is different then a room full of students where a quarter of them aren't being parented properly. We can not expect out teachers to raise our children. We as parents should be sending them to school with a sense of self-respect, if nothing else. At the same time, I've known teachers who have given up control of the classroom to the students at the first sign of adversity...that shouldn't happen. Seriously? You think a teacher's job is to control kids? As both a parent and a teacher I will tell you definitively that your job as a parent is to teach your child self control and my job as a teacher is to manage a broad range of classroom issues, including reminding your child, in a firm but kind way, to regain self control when he or she forgets to self manage, so I can get back to educating the 30+ children under my care. REALLY?!? Teachers are NOT babysitters, they are TEACHERS..........GET IT? Yes, unfortunately, teachers have had to shoulder the responsibility of giving the students home-training that parents are unable to parent into them. However, don't lecture me about how your kid can't pay attention when he's sitting in a crowded room learning about Shakespeare, and he's constantly aware that he has the ability to text and play videogames in his pocket. You want your kid to pay better attention in school? Don't send him to school with a bloody iPhone. And if you do, don't get mad at me when I confiscate it. Temple Run is not more important than logarithms. Sorry. The statement: "The only difference was teacher implementation." I have a major problem with this statement; you left the student's ability and willingness to learn out. We can give our best, and try student-centered learning and re-create and implement new ideas and policies every year. But comparing class to class and school to school is inherently unequal because every student in every classroom has different abilities, level of willingness, and outside factors that playa huge part in student achievement. It can not be the sole responsibility of the teacher to get students to 'perform'. And if state standardized test scores are your only mark of student achievement, then I feel bad for your students. "We all used the same curriculum, received the same professional development and taught the same student population." I'd like to see those results so I can verify if, indeed, that was the only difference. Did all teachers have the same degree of administrative support? How about the same degree of support for Special Ed and ELL students? Parental involvement was the same from school to school? How about physical condition of the building: it's harder to learn when your classroom is an oven – or a fridge – or if students are crowded 10 to a table meant to hold 6-8. There can be SO SO SOOOO many other factors besides curriculum and student population that might be affecting the outcomes; assuming the "only" difference is teacher implementation at the classroom level is overly simplistic. Thanks ATLWmn! This was exactly my point! New teachers often already have a "probationary" period of 2-3 years, and many districts already provide mentoring for those new educators, but many just throw teachers into the shark tanks and they sink or swim before they even GET the chance for tenure. Aside from that pre-tenure probation, how would you decide who gets it and who doesn't? As a "new minority teacher," I stand with that 46%. I would love to see more accountability for teachers. I would love to see more accountability for teachers, though, in the same sense that I would love to see an economic system that left none at a disadvantage, and while they both sound quite nice, I've seen a disturbing lack of concrete detail to flesh out these abstractions. HOW do we rate teacher effectiveness? There are too many elements that go into why success happens or doesn't happen. Test scores are an unfair measure, as they reflect upon one teacher out of 12 in a student's career. Grades are an unfair measure, as they can drop due to environmental factors or sheer laziness. Most veteran teachers that I have spoken to disapprove not because of ideological differences, but because of the practicality of it. I don't feel like I'm the best teacher I can be, but I credit a lot of that to the support system that teachers often don't have. If we're going to judge teachers based on performance, we need to triangulate that with the other factors that go into affecting a child's education - home environment, parental involvement, school and district administration, for starters. The only books in my classroom are on loan from my personal library. This is a problem that, in my eyes, impacts my students' growth far more than whether or not I apply Kagan strategies to my lesson. The vitriolic rhetoric needs to end. Start suggesting solutions or stop stirring up lynch mobs. Sadly, resistance to change spans across too many fields and I agree with you wholeheartedly, Aadina. I read a book recently that made me think about this very thing... book was called "Question Behind the Question" and it focused on finding in ourselves a sense of accountability so that we can ask ourselves "what can I do to make (fill in the blank) more efficient, higher quality, etc..." you name the betterment. Point was that it's far more difficult to change the way people do things and remarkably easy to ask ourselves the right questions that will help us provide a better service. Leading by example will perhaps trickle into the rest so cheers to you for being that example and for bringing this to light in the teaching field. Living in a town where Michelle Rhee was sacked for arguing points along these line, I find this editorial to be really refreshing. And coming from a veteran teacher, all that more compelling! With all due respect, these two items are not 'interchangeable'. To say that you would 'give up' tenure 'in order to be a better teacher' is not logical, as one does not prevent the other. You really can have both. If you work that hard to better yourself, then you deserve to have the stability of tenure and due process, which is already in place.